It’s been about two years since Built.io launched Contentstack, a headless content management system for the enterprise. Contentstack was always a bit of an odd product at Built.io, which mostly focuses on providing integration tools like Flow for large companies (think IFTTT, but for enterprise workflows). Contentstack is pretty successful in its own right, though, with customers ranging from the Miami Heat to Cisco and Best Buy. Because of this, Built.io decided to spin out the service into its own business at the beginning of this year, and now it’s doubling down on serving modern enterprises that want to bring their CMS strategy into the 21st century. Back when Contentstack launched, the service positioned itself as an alternative to Drupal and WordPress. Now, the team is looking at it more in terms of Adobe’s CMS tools. And these days, it’s all about headless CMS, which essentially decouples the backend from the front-end presentation. That’s a relatively new trend in the world of CMS, but one that enables companies to bring their content (be that text, images or video and audio) to not just the web but also mobile apps and new platforms like Amazon’s Alexa and Google’s Assistant. Using this model, the CMS essentially becomes another API the front-end developers can use. Contentstack likes to call this “Content-as-a-Service,” but I’m tired of X-as-a-Service monikers, so I won’t do that. It is worth noting that in this context, “content” can be anything from blog posts to the descriptions and images that go with a product on an e-commerce site. Not every company needs this kind of system that’s ready for an omni-channel strategy, of course, but even for companies that still mostly focus on the web — or whose website is the main product — a service like Contentstack makes sense because it allows them to quickly iterate on the front end without having to worry about the backend service that powers it. 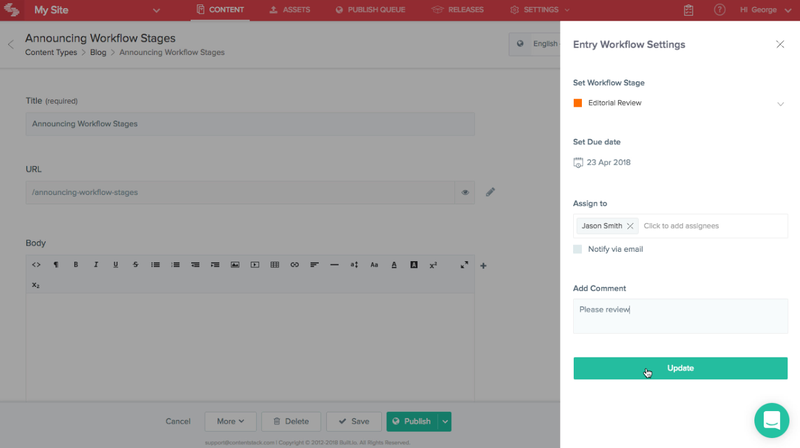 The latest version of Contentstack introduces a number of new features for content editors, including a better workflow management system that streamlines the creating, review and deployment of content in the system, as well as support for publishing rules that ensure only approved content makes it into the official channels (it wouldn’t be an enterprise product if it didn’t have some role-based controls, right?). Also new in today’s update is the ability to bundle content together and then release it en masse, maybe to coincide with a major release, promotional campaign or other event. Looking ahead, Baier tells me that the team wants to delve a bit deeper into how it can integrate with more third-party services. Given that this is Built.io’s bread and butter, that’s probably no major surprise, but in the CMS world, integrations are often a major paint point. It’s those integrations, though, that users really need as they now rely on more third-party services than ever to run their businesses. “We believe the future is in these composable stacks,” Baier noted. The team is also looking at how it can best use AI and machine learning, especially in the context of SEO. One thing Contentstack and Built.io have never done is take outside money. Baier says “never say never,” but it doesn’t look like the company is likely to look for outside funding anytime soon.